Student Passes are available online for current Yale students and require a valid Net ID. 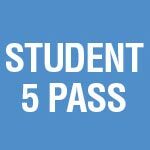 Other high school, college, and graduate students may purchase discounted passes by calling 203.432.1234 or visiting the box office at 1120 Chapel Street and providing current proof of full-time student status. You may purchase two passes per Student ID and may be asked to show proof of eligibility to enter the performance.